Microtubules are part of the cell’s cytoskeleton, helping the cell resist compression, move vesicles, and separate chromosomes at mitosis. Microtubules help the cell resist compression, provide a track along which vesicles can move throughout the cell, and are the components of cilia and flagella. Cilia and flagella are hair-like structures that assist with locomotion in some cells, as well as line various structures to trap particles. The structures of cilia and flagella are a “9+2 array,” meaning that a ring of nine microtubules is surrounded by two more microtubules. Microtubules attach to replicated chromosomes during cell division and pull them apart to opposite ends of the pole, allowing the cell to divide with a complete set of chromosomes in each daughter cell. cytoskeleton: A cellular structure like a skeleton, contained within the cytoplasm. 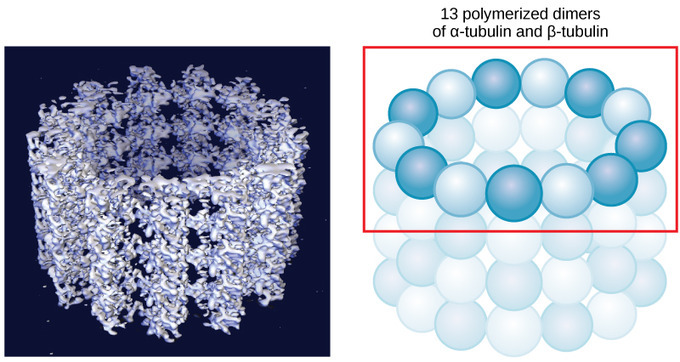 Micrtubule Structure: Microtubules are hollow, with walls consisting of 13 polymerized dimers of α-tubulin and β-tubulin (right image). The left image shows the molecular structure of the tube. As their name implies, microtubules are small hollow tubes. Microtubules, along with microfilaments and intermediate filaments, come under the class of organelles known as the cytoskeleton. The cytoskeleton is the framework of the cell which forms the structural supporting component. Microtubules are the largest element of the cytoskeleton. The walls of the microtubule are made of polymerized dimers of α-tubulin and β-tubulin, two globular proteins. With a diameter of about 25 nm, microtubules are the widest components of the cytoskeleton. They help the cell resist compression, provide a track along which vesicles move through the cell, and pull replicated chromosomes to opposite ends of a dividing cell. Like microfilaments, microtubules can dissolve and reform quickly. Stained Keratin Intermediate filaments: Keratin cytoskeletal intermediate filaments are concentrated around the edge of the cells and merge into the surface membrane. This network of intermediate filaments from cell to cell holds together tissues like skin. Microtubules are also the structural elements of flagella, cilia, and centrioles (the latter are the two perpendicular bodies of the centrosome ). In animal cells, the centrosome is the microtubule-organizing center. In eukaryotic cells, flagella and cilia are quite different structurally from their counterparts in prokaryotes. Intermediate filaments (IFs) are cytoskeletal components found in animal cells. They are composed of a family of related proteins sharing common structural and sequence features. Intermediate filaments have an average diameter of 10 nanometers, which is between that of 7 nm actin (microfilaments), and that of 25 nm microtubules, although they were initially designated ‘intermediate’ because their average diameter is between those of narrower microfilaments (actin) and wider myosin filaments found in muscle cells. Intermediate filaments contribute to cellular structural elements and are often crucial in holding together tissues like skin. 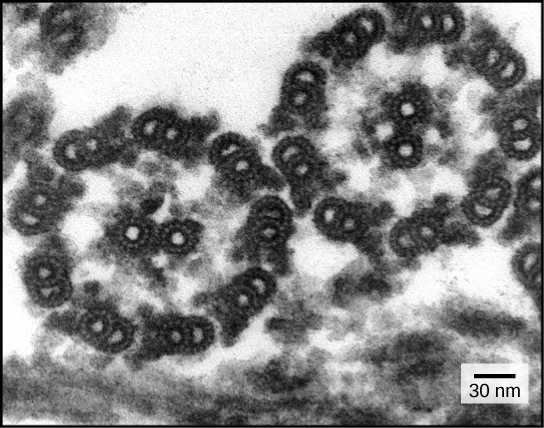 Microtubules are the structural component of flagella: This transmission electron micrograph of two flagella shows the 9 + 2 array of microtubules: nine microtubule doublets surround a single microtubule doublet. Flagella (singular = flagellum ) are long, hair-like structures that extend from the plasma membrane and are used to move an entire cell (for example, sperm, Euglena). When present, the cell has just one flagellum or a few flagella. When cilia (singular = cilium) are present, however, many of them extend along the entire surface of the plasma membrane. They are short, hair-like structures that are used to move entire cells (such as paramecia) or substances along the outer surface of the cell (for example, the cilia of cells lining the Fallopian tubes that move the ovum toward the uterus, or cilia lining the cells of the respiratory tract that trap particulate matter and move it toward your nostrils). Despite their differences in length and number, flagella and cilia share a common structural arrangement of microtubules called a “9 + 2 array.” This is an appropriate name because a single flagellum or cilium is made of a ring of nine microtubule doublets surrounding a single microtubule doublet in the center.